Like some sort of dystopian futurist society, I've endeavored to recycle some of the previous console generation into some new game-centric content here at the ol' Sandwich. To begin, I'm going to replay the entire Arkham Batman series at a casual pace. I know, it's kind of confusing. Let me explain. I want to do this replay in chronological order, just to see how well the plot and series arc lines up, and also because that means I get the worst game in the series out of the way first. 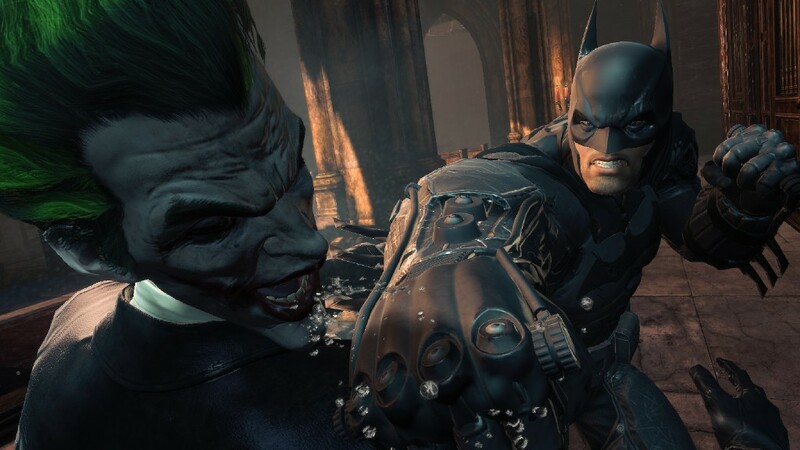 Arkham Origins is a 2013 prequel to the two hit Batman games that put Rocksteady on the map. It takes us back to the early days of Batman's career, on a frosty Christmas night where he is targeted by seven deadly assassins, challenged by deranged losers, and meets his ultimate nemesis for the first time. When the game dropped in October, it had the largest marketing campaign for the series yet, including a television ad directed by none other than Tim Miller, director of 2016's Deadpool. And while that television commercial might have been pretty damn strong, Origins didn't fare very well with consumers. The game is largely remembered as the illegitimate child to the side of Rocksteady's trilogy, as it was developed by WB Montreal on a tight deadline and released with a cavalcade of bugs and very few new mechanics or elements. I think the rotten reputation of the prequel is a little overblown. 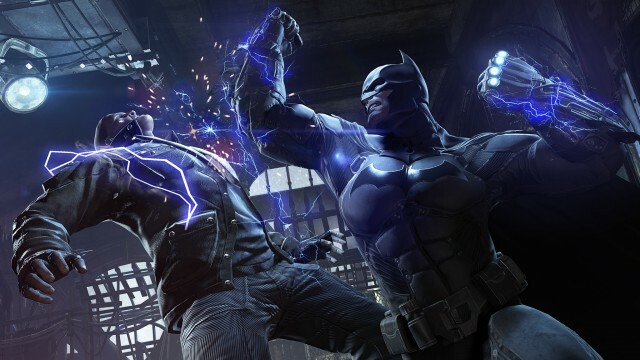 It exists mostly to whet the appetites of fans while Rocksteady was sequestered making Arkham Knight, which went through a longer production I imagine because it was the first of the series slated for the PS4/Xbox One generation. On a technical level, yeah. It's pretty plain that this entry to the series was baked with a little less love and a little more attention to profit margins. The first two games featured a universally-praised melee combat system, an all-star voice cast including Kevin Conroy and Mark Hamill, and an overflowing basket of easter eggs for the loving DC comics fan to explore. This game? Not so much. The combat system returns largely unchanged, and there are handy new features like a fast-travel system, but this prequel is all steak and no sizzle regarding plot progression, cutscenes, and environments. The map, while much larger than the previous Arkham City, is unimpressive to say the least. Half of it is the very same "Old Town" map from AC (of course, without the Escape From New York deterioration or giant prison walls), and the other "New Gotham" half is largely a repository for the larger indoor settings like the Royal Hotel and the My Alibi nightclub. Worst of all, there's just nothing out in Gotham City apart from the same copy-and-paste brute squads to be thrashed. No Gotham landmarks rich in detail and visual storytelling that can be scanned for backstory and collection purposes. Certainly no sense of urgency attached to random encounters in the form of "Crimes in Progress" announced over the police scanner. No hidden side plots that can only be initiated by following a strange noise and answering a random payphone. Between the two sections of city is the Gotham Pioneer Bridge, which is entirely too tedious to traverse manually. I kept hoping the bridge would factor into the plot somehow, say if it were destroyed by a villain (explaining its absence in the other games) or contained a secret underground bunker. When creating an open-world map, the goal should not be to make the player thankful for fast travel, but Arkham Origins can join Assassin's Creed III at the table marked "Nice Big Map, Nothin' Interesting In It." That's not to say Origins doesn't have a lot of content. It has plenty of Riddler (excuse me, "Enigma" because evidently this is the night Batman meets, like, seven of his greatest adversaries completely unconnected to each other) collection challenges in the form of data packs to acquire and server relay antennas to destroy. Smaller villains like Mad Hatter and Anarky have their own little side quests, and of course the endless optional challenges return to reward a player with concept art, alternate costumes, et cetera. This stuff is all great. It's fun to do, it provides a little bit of a variety to the typical fetch quest formula, and it hits some satisfying DC lore along the way. The problem is that, unlike the rest of the series, this game's "busy work" feels even more like busy work when none of it connects to the main plot very well. All told, the main story missions are only about eight or nine hours of play, and the disproportionately huge amount of scattered side content essentially takes over the game, even necessitating more database/progress meter real estate in the menu system than is reasonable. One new feature that played to me quite well was the crime scene investigations, wherein Batman's Detective Vision is used to recreate AR projections of the crime that the player can scrub through using the shoulder buttons. It's a fun riff on the "Greatest Detective" part of the character, but it's even more shallow of a click-the-clue detective simulator than Rockstar's L.A. Noire was. Essentially, the game highlights the next clue, prompts you to scan it, then gives you the answers. That's a fine microcosm of the game's weaker additions to the franchise; too many prompts and too many knucklehead press-to-win scenarios. That includes the game's new gadget, the shock gauntlets. While Batman's usual arsenal is all here (even with re-skins like the glue grenades to stand in for Arkham City's ice grenades), the shock gauntlets are the only one that let you circumvent the best mechanic in the game--the combat--entirely. Foes with riot shields, armor, or too threatening a weapon usually require a combo attack or special maneuver, and the gauntlets essentially allow you to skip over that once a progress meter is filled. 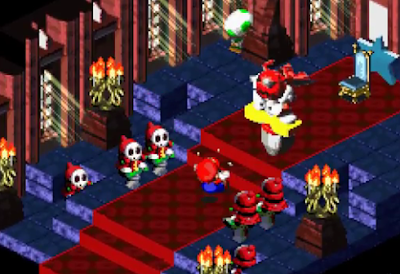 I will say that some of the boss fights are pretty inspired in their gimmicks. Much hay was made over the first big fight against Deathstroke, which seemed so very difficult so early in the game only because the gadget-fight-gadget timing is never explained, and nowhere does the game explicitly say "This fight, when done properly, still takes a long time and a lot of patience." I loved that fight, because it was a genuine challenge. Later on in the game, a room full of goons led by Deadshot have to be dispatched silently using Batman's stealthy "predator" methods, very reminiscent of the Mr. Freeze fight from Arkham City, though completely devoid of the creepy frozen morgue ambiance. A bombastic projectile fight on the Pioneer Bridge with Firefly scored points with me just for the variety of moves it encompassed, though this was also the site of the biggest bug in the game that I've encountered, and...sure enough, five years later that bug still persists on my Xbox 360 copy, even after updates. I'd say the real dud fight was the final cat-and-mouse game with an animalistic 'roid-raged Bane staged in a laughably small environment inside the maximum security wing of Blackgate prison. It takes forever, and relies on a blink-and-you-miss-it QTE that requires endless preparation. I really expected more combat-oriented fights from the "seven deadly assassins" plot, but the majority of the named assassins are dealt with via the Predator encounters and simple combos. 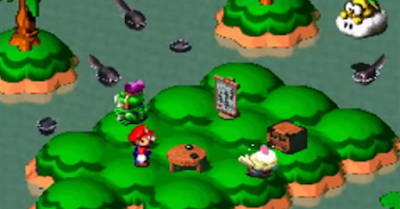 One element of the game that is fresh for the franchise is the ability to return to the Batcave. Occasionally, Batman will require a new piece of tech or the use of the cave's computer and flies back in the Batwing. The cave includes a combat simulator (with its own series of challenge scenarios, naturally), and a few of those visual details that are missing from the city. The Batmobile is under a dropcloth, her guts all over the garage floor. Bruce's Christmas dinner sits untouched next to the computer, and an elaborate conspiracy map fills a wall. And there's Alfred. The player can choose to talk to the faithful butler and are rewarded with an increasingly engaging bit of character development, as the older man tries desperately to coax his surrogate son to call it a night. 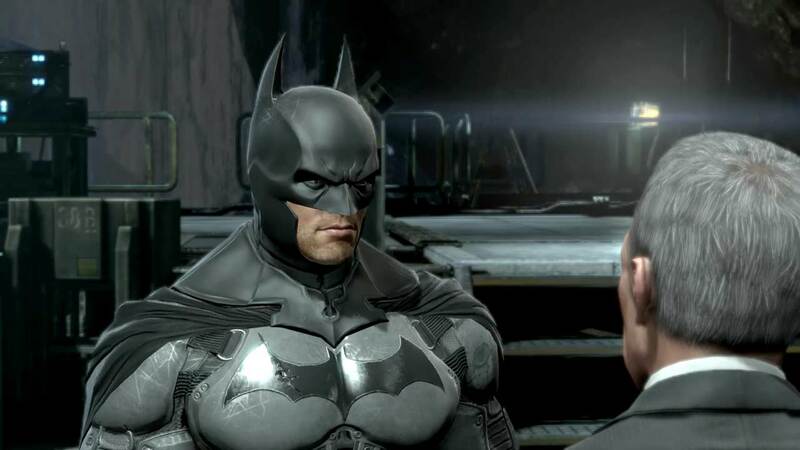 I didn't expect to feel a pang of emotion on a replay of this game, but there's a strong amount of restrained pain midway through the game when Alfred hails Batman over the radio just to say, "Sir, it's midnight. Merry Christmas," and Batman merely mumbles "You too," before moving on to the next wave of baddies. Whoever wrote that exchange has my heart. By the way, this tumultuous yuletide night only takes place five years before Arkham Asylum, and it must have been one doozy of a five-year gap. The Penguin, Jim Gordon, and Alfred all have jet-black hair, Bane is of normal human proportions instead of a hulking monstrosity (until the last few hours of the game), and apparently the entire GCPD is made up of hardened criminal scumbags, since Batman has no qualms about pounding all but Gordon into pudding. Funny enough, this laughably small time gap mirrors the same problem in DC's New 52 arc of the comics, wherein Bruce Wayne becomes Batman, and a mere five to eight years later everything in the Batman timeline has already happened, including all four (or is it five?) incarnations of Robin. I won't get too nitpicky about this time thing, but it's worth noting just how haphazard the unifying story of this series is weaved. More on that with the other games. The plot itself is serviceable, in that it ties together a lot of largely unrelated adventures involving as many Batman villains as possible. One thing that garnered a lot of derision from fans was the hard shifting of focus onto...you guessed it, the Joker. Though Black Mask is ostensibly the main baddie of the game, Joker takes over less than halfway through the game and dominates the rest of the plot. I know he's a fan favorite, but it's a tedious use of the character and easily could have used any number of other interesting villains. Origins did exactly what it was advertised to do: it kept the franchise alive until the next generation of consoles released, it functioned as WB Montreal's big graduation from browser games and Wii ports to the full production of a AAA title, and it gave Rocksteady a little breathing room and fresh market research for the proper conclusion of their trilogy. It has very obvious thin spots, and it fails to stand equal to the two previous installments...at least, as far as memory serves (this is kind of another reason why I chose to start with this one). But Batman: Arkham Origins certainly is not the trash fire it was branded as back in 2013. As a matter of fact, it might not even be the worst of the franchise, depending on your proclivity for wonky driving challenges. Eh, it's certainly not essential, but if you're looking to satisfy a completionist itch--and what better franchise than this one for it--it holds up a hell of a lot better than some of the lesser Assassin's Creed entries. And if you choose the chronological order, things only get better from here. It just doesn't feel like a proper entry in the series. It's a slapdash cash-in on an existing franchise's goodwill, but I've seen much worse (looking at you, Call of Duty). Suffice it to say, there's not much reason to replay Arkham Origins in and of itself, much like there's no real reason to rewatch The World is Not Enough unless you're doing the entire Bond series.